Ramsey & Angling District Society fished on Oak Pool at the Decoy Lakes complex at the weekend and found the fish more than willing to feed as the match produced an excellent result with no fewer than eight of the field putting 100lb plus weights to the scales. 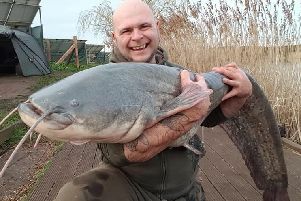 Match winner Rob Wright had a day to remember as he racked up a massive 228lb 4oz net of carp from peg 4 taking his fish on a short pole line with pellet. In second place was Josh Pace who was on peg 12 and also caught well on a short pole line to finish with a level 198lb. Keith Rayment was third from peg 27 with 152lb, and then came John Price with 148lb. This Sunday’s club match is on Jay Lake at Pidley which is in fine form and match organiser Keith Rayment tells me he still has pegs available. As more and more of the area’s top anglers are heading over to the fishery the big Saturday open matches at this venue are being fished over two lakes. On Two Islands Barry Young led the way. He drew peg 1 and put 140lb 4oz to the scales. Runner-up was Kevin Peacock with 110lb 15oz. The Wagtail Pool was also producing some big weights, although its always going to be difficult to beat peg 11. Lucky angler to draw the hot peg this week was Simon Dow. He is a class rod and made no mistake topping the field with a fine 141lb 2oz. Runner up was Martyn Freeman on peg 21 who weighed in 93lb 12oz. JVAC anglers fished on the Cedar Pool at Decoy which saw those fishing meat rule the roost and thankfully the early pegs on this one also fished well. Match winner Chris Saunders drew the end peg 1 and caught steadily all day on the pole and meat for a match winning 177lb. Webbs AC fished the big carp lake at Kingsland which saw a good turnout find the venue in good form. Top rod was Andy Perry, who usually relies on a feeder approach and it worked well for him once again as he was a clear winner with 97lb 10oz from peg 16. Andy fished a short line with red pellet in the feeder and pepperoni on the hook which saw him catch carp close to double figures. Runner up was Kevin Peacock, who fished the pole and luncheon meat combination from peg six falling just short on 89lb 9oz. Phil Jones came third with 59lb 6oz, followed by John Crouch with 55lb 7oz. Elm Lake at Decoy was the venue for the latest Over 55’s Open match fished on Friday in rather cold and windy conditions. Top rod with a very impressive display on long pole and pellet fishing was Steve Dorks on peg 16, putting 147lb 8oz to the scales. On the opposite bank was Roy Whincup who caught a few on a little feeder, but had a good late run of fish on cat meat fished close in from peg 10 to see him finish with 139lb 9oz. Gus Gausden on peg 8 was third with 112lb 7oz after using a short pole line with sweetcorn and pellet.